Near-record heat continues across the country, with almost every region reporting unseasonably high temperatures. Ranging from 1degC or 2degC above the norm in the North Island, to a scorching 8degC above average in Central Otago, this summer is on track to break records as our hottest and driest. Some regions were reporting almost 30degC weather at 11am on Sunday. Phillip Duncan from WeatherWatch tells Newshub the temperatures nationwide are unusual and we are experiencing midsummer extremes for long periods far earlier than expected. "Temperatures of eight degrees above average in Central Otago for extended periods are well outside the norm." Mr Duncan says the high temperatures might be welcomed by beachgoers but bad news for farmers, with crops and livestock suffering in the extended dry heat. WeatherWatch says the high temperatures may be here to stay, with a brief cool-down for some mid this week, and the heat returning by the end of next week. High temperatures have driven extreme weather events across the country in the past few weeks, including flash flooding in Roxburgh, which closed roads and forced people from their homes. Mr Duncan says the extremes in weather we are experiencing are at least partially due to climate change. 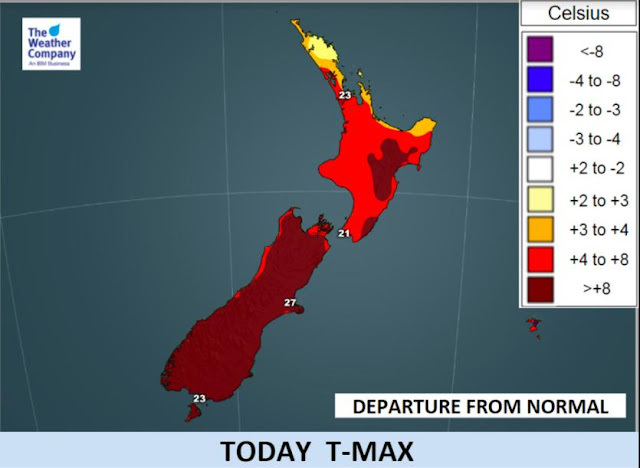 Summer's here with a high of 31°C in Hanmer Springs and temperatures well into the 20s across the rest of the country. MetService said the lowest temperature today was 20° at Waiouru, while the Canterbury towns of Darfield, Cheviot and Waipara all reached 30°. People took to the water and Horizons Regional Council tweeted it had been a cracker of a weekend at Foxton Beach. MetService meteorologist Ciaran Doolin said a ridge of high pressure should bring clear and hot conditions well into next week. He said the ridge could also bring thunderstorms but in less populated areas of the central North Island. "There are a couple other weather systems trying to push this ridge out but it's persistent so we should see good temperatures well into next week." Mr Doolin said temperatures yesterday and forecast for this week were higher than usual for the start of the summer - Christchurch had 30° yesterday, last year's summer average was just 21°. MetService warned it would be even hotter tomorrow so people should keep the sunscreen handy. Meanwhile Niwa said that soil moisture levels across New Zealand were now below or considerably below what was normal at this time of year.